For the past few months I’ve been feeling rather down and not my usual self. Disappointed that I had to cancel the Lundy trip this year, not really feeling motivated and struggling with being on the edge of the rabbit hole, I had some small trips planned (the Bothy at Peppercombe, and later in the year Snowdon) but I didn’t really have a big adventure in the pipeline. As usual I had ideas zipping around my head (Driving my Figaro to Japan was a contender – has been for many years that one!) but was finding it difficult to settle on one. One that really grabbed and excited me. I’d started researching my family tree, joined the Weavers and Spinners guild and started to learn to card and spin fleece…but something was missing. It was after a rather emotional chat with the fabulous Judith Morgan, that I knew I needed to commit to my next trip and to start research and planning straight away. Island Hopping, Island Odyssey or the snappily named ‘The Creative Adventurer visits as many of the small islands around the UK as possible in as many different ways as possible’ started to take shape. This was an idea that kept popping up so thought, OK I need to grab this one and work with it. My recent Book Barn haul. Cost just £12 for all these gems! 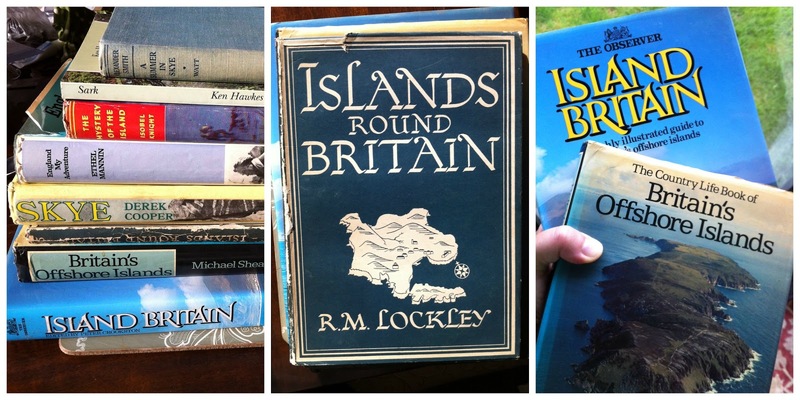 RM Lockley, I've discovered, lived on Skokholm Island and has written over 50 books about Island life, nature and birds. He sounds a fascinating character and warrants further research. His book, The Private Life of A Rabbit, inspired Watership Down. So that’s what I’ve been doing for the past few weeks. I declared this as my next project in the business group I'm in on 27 April at 10:46. Prior to this announcement it had popped up on my mind maps and in my note book, way back even in February and I’d mentioned it on my blog on a Wish List that I posted on the 04 February and I’m sure it had been floating around as an idea well before that. Personally, I find it interesting how my mind works in that way. How long it can take before I grab a particular idea and start to turn it into reality. How about you? What happens when you get an idea? Do you act on it straight away? Let it sit for a while? Days, weeks, years? Since then I’ve been collecting books on Islands, reading about Islands and I’m looking for people that live on these Islands. I've become a tad obsessed by Islands (in a good way!) and I find old books a great inspiration. 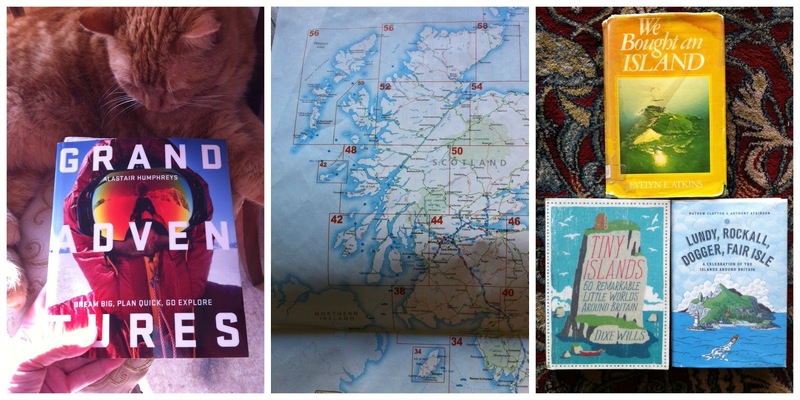 I have also been reading Tiny Islands by Dixie Wills; Lundy, Rockall, Dogger, Fair Isle by Mathew Clayton & Anthony Atkinson and Grand Adventures by Alastair Humphreys, so its not all old books I'm using for research. I have discovered that there are around 4,000 islands around the UK, and of course the question then is – what constitutes an Island? Some are just giant slabs of rock that only birds can really land on so I’m not planning on visiting those. I’m looking for the interesting, the quirky, the creative, the traditional celebrations and crafts, the hidden gems, the stories, the things that make these islands special. I’ve already got a list of about 60…and counting. There is so much to explore around our own coast. Shall it be one trip…or split into ‘legs’? Initially I’d thought I’d set a budget say, £500 and how many Islands can in visit for that? Quickly realising that actually not that many, even travelling as self-powered as possible. I am still working out the finer details as I read about different islands and hopping from each one. I know I want to cycle on some of them. Until then I was wondering – have you visited any of the UK’s small Islands? Where have you been? What was your experience? Do you know anyone who lives on one that you’d be happy to put me in touch with? What Islands should not be missed? Drop me a line or comment below. I’m very much looking forward to sharing this next Creative Adventure with you!